Caesar III (and such city-builders by Impressions) + A-Train. A-Train, on the right, is an early transport game that has a lovely concept of factories which produce building material (the white cubes) which a player can move to stockpiles created elsewhere on the map via freight train. The simulation would then use the building material to build structures and grow the city, particularly when encouraged by a player who has set up passenger rail lines to attach them to the greater transportation network. We’ve got building material here, an importance placed upon moving it around, and it being required for city growth, all solid assumptions to build on. Caesar III, on the left, is one of many of the Impressions Games style city-builders. The screenshot shows some warehouses full of wine, arms, and a couple lonely-looking bits of furniture. Much more exciting than white cubes! Here the player gets a direct, rich graphical representation of the productive output of their settlement. Also, for bonus points, the aqueducts you can see there have to hook up water to reservoirs to supply fountains. Simple as it is, the concept of hooking up networks in certain places makes position of structures all the more important, though Sim City probably started all that vs. totally abstracted positioning like Civilization‘s notion of city buildings (or vs. making position a factor but actually irrelevant, which doesn’t do anyone any favours). Which leads to a thought on player decisions: Bruce Geryk wrote some analysis or other of war games and had a lovely line that said: “If there is only one best move, then it isn’t a game – it’s a puzzle. Figure out the puzzle and you’re done.” and further, the roughly paraphrase, that a decision that is optimally made in only one way should not be left up to the player. Basically, if there’s a decision with one option, it’s a waste of time to make the player make it. Exception might be made for aesthetics but we want to be sure to make those sorts of decisions are opt-in. Relevant here is the staple Sid Meier quote: “A games is a series of interesting choices.” which is a notion we certainly wish to uphold with CE. Settlers 2, on the left, gave a player control over a kingdom of identical little workers who would walk only on paths created by the player (Daniel called it “Lemmings crossed with Sim City”). The workers carry unique commodity types along these paths that can be visually identified per type — a worker carrying a log would heft a little log on his shoulder. Optimal path & flag layout is extremely important for balancing efficient transportation of goods with population and empire size, and visual feedback makes for wonderful graphical feedback for what would otherwise be a dry logistics problem. Instead, the player can see quite directly where a supply chain is backed up. Along these lines, Settlers 2 was a very pretty game for the time with trees waving in the wind, sparkling water, and rabbits hopping around lush meadows. Remember, this is the 90’s we’re talking about and it was seriously amazing back then. There’s something singularly rewarding about chopping down a lush forest and turning it into planks via your sawmill which we want to capture in CE. Anno 1503, on the right, and the rest of the Anno series are also beautiful games with lovingly rendered architecture, forests, and seas, though they’re a bit less dynamic in gameplay. Fundamentally Anno is about a player upgrading their settlements by building production chains which unlock higher population levels which allow construction of new production chains which unlock higher population levels and so on and etc. A key point here, like in Settlers as well, is that progression is made through actually building advanced industries conditional upon other, less advanced industries. There are no abstract ‘research points’, progress is embedded in the working physical infrastructure which a player sees and manipulates. This is mixed up a bit by requiring resources produced on different island types, so the player must trade or colonize. Anno 2070 mixed the formula up a bit by loosening island/biome resource limitations in some ways and adding a bunch of metagame, but Anno is still built on a far more rigid industrial progression than we’d like for CE. Beautiful art, of course. And that’s just citybuilders. 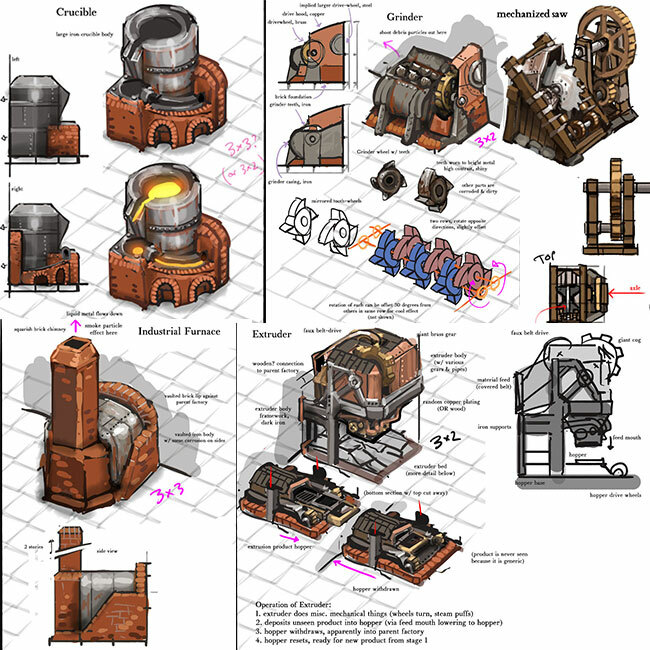 There are definitely design influences to discuss from Minecraft-style “redstone logic” or the notion that these production-logistics games are essentially a strategy game’s take on RPG-ish crafting systems that lie near the heart of games like Terraria and, again, Minecraft or … well, all that said, let’s get back to factories in Clockwork Empires. The Factory: A large building full of whirring machines and toiling workers. It takes in one set of “commodity” (in our design vocabulary, a generic name for any resource or good in CE’s economy) inputs and produces one particular commodity output. Factories require a lot of infrastructure, have very specific inputs and outputs, but they’re the most efficient means of production. The Artisan: A home/shop run by one skilled craftsman, like the baker, butcher, or candlestick maker. (Note: Clockwork Empires will not contain candlestick makers as they’ve been made obsolete by scientifical clean-burning Perfectly Safe gaslamps.) Artisans are small and slowly produce specialized goods. And they will almost certainly be put out of business by the factories you get around to building. Yay, progress! 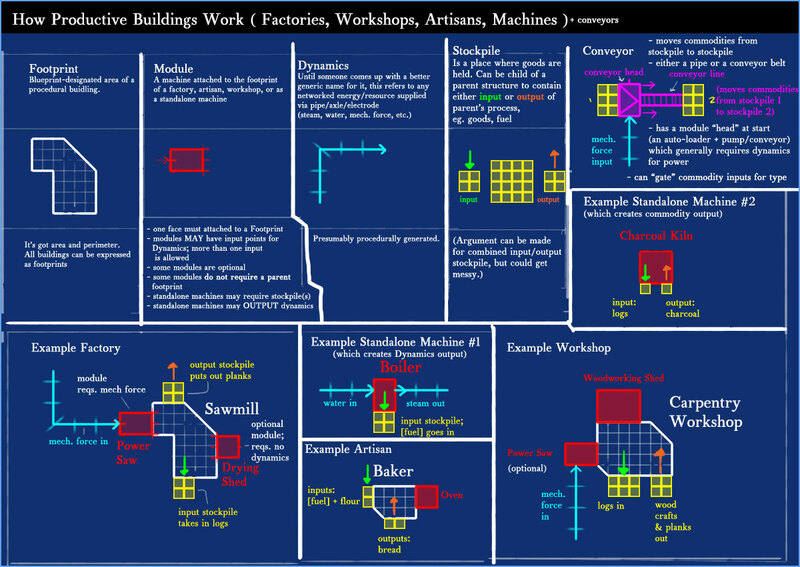 The Workshop: A sprawling, crude, generic production facility which cover a broad categories of industry (e.g. metals, woodworking, ceramics). A workshop take in a relevant set of commodity inputs and outputs any possible product that can be made with those goods, but far less quickly and efficiently than a Factory and somewhat less than an Artisan. 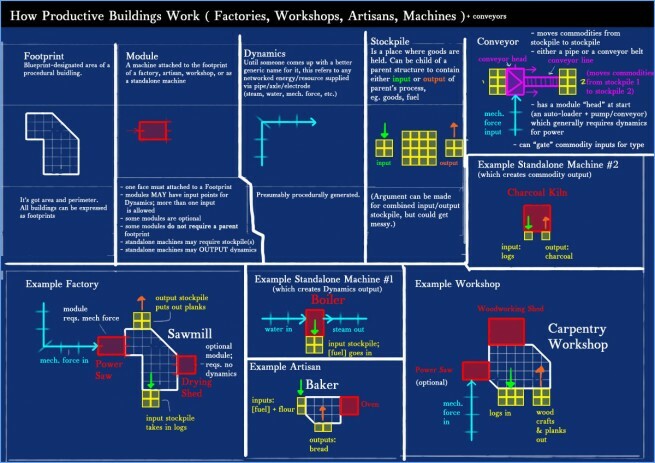 The point of building a workshops is to fill in gaps in production chains, for example because you badly need some giant cogs, metal plates, and muskets but can’t afford to devote a factory to each separate commodity yet. The Standalone Machine: A single machine that does one thing. For example windmills (to harness the power of wind for The Empire), water pumps (to pump water), boilers (to make water into Perfectly Safe steam), charcoal kilns (to make useless forests into useful charcoal), and other such devices that serve to carry out specific functions or commodity transformations. This isn’t as confusing as it looks because all four of the above categories of production buildings work in essentially the same way: they exist in a physical location, they take in stuff, they output stuff. That’s all you need to know. And all the requirements for building each correctly will be given at the time of construction so you don’t have to look up on a wiki how to turn ore into cogs. One very important point here, as per the design goals and inspirations previously mentioned, is that we want to show not tell what is happening in factories, workshops, and artisan shops. Therefore all of the individual machines (called “modules” in our design vocabulary) that are required for a production building will actually be outside of the factory structure, set into the perimeter walls. Putting the modules outside of the factory may seem ridiculous from a standpoint of realism (“What if it rains?”) but it serves important design functions: the player can see at a glance what their factory needs to operate, how mechanized the factory is, and it’s totally awesome. It simply wouldn’t be proper there weren’t technically unnecessary gears and pipes stuck out in the open for us to appreciate. Likewise, we’re putting the input/output stockpiles in the open air like Caesar and Settlers do. This lets you pile up commodities and gaze upon the bounty of your industry – or you can identify production and logistics bottlenecks, places where the system has broken down and requires your attention. A sawmill with a pile of fresh, quivering logs clogging its input and no planks in output is probably lacking workers or mechanical force to drive its power saw. How various production buildings work & attach to one another. The human component: It’s not in the above diagram, but you can get away with building an unpowered factory that operates entirely on human power. It’s not efficient, but your workers can run the Power Saw module off of some kind of Wheel of Pain inside the factory. As you build more sophisticated sets of interconnected machines — pumps, boilers, voltaic turbines, aetheric reactors — you can increasingly mechanize factories, replacing human workers with giant, whirling, Perfectly Safe machinery. This frees up workers to take up employment in other more different factories, toil in the salt mines, be conscripted into the New Model Imperial Army, or just lounge about unemployed in Perfectly Safe tenements. Yay, progress! Machine module concepts. The Grinder probably needs more Perfectly Safe terrifying gears. There’s more to it than all that, of course (like Megaprojects, the effects of inputting wrong inputs, Eldritch Influences, and so forth). Our ultimate goal is to give players a set of tools that they can put together in ways we never imagined to make ridiculously complex systems that explode gloriously. Now I need to get back to bugging Sean about aligning pipes and axle inputs consistently on every single machine module so our procedural pipe/axle system can hook up properly. Til’ next time, keep your boilers stoked. CE looks like the game I’ve always wanted. I’m already completely floored by it. I wish I had my degree already so I could come work for you. For a long time I was anticipating SimCity 5. Now I really don’t care about it anymore. This is precisely what I want. Regarding “dynamics” – let me suggest “power lines” as a more descriptive name. Will there be a place for magic of some kind? Magical power extracted from special trees, blood-ducts carrying blood of the innocents to a demon-producing altar, that sort of thing? Or will it be 100% “real materials”? (I’m OK with both, just curious). You seem to have avoided mentioning a very typical kind of machines: vehicles. Will they appear? Everyone knows that what is called “magic” by suggestable rustics can in true fact be explained by rational scientific means. That all such phenomena have not been so explained is simply a challenge to learned men & women of The Empire to rise to their duty in these progressive times! Exquisite. I look forward to making crates out of cabbage, too. One question, though, speaking of Perfectly Safe things – will you have gasogenes? They make your drinks fizzy, but they tend to explode. I demand the magic of Tesla! Perfectly Safe…that sounds like FUN. Looks great, we’ve been waiting for another city builder. Caesar III was the last great one I can remember. I love “god games”. I’d vote for Pharaoh (later game in the same series), aside from the monuments brilliant game. Seeing your personal mansion burn down and half the population wandering the streets because you forgot to allow the granaries to accept any new food – it was fun! That is all. You will have my $20 as soon as I can dig it out for Clockwork Empires. Looks great. I was/am great fan of settlers 2 and civilization. For me, the fantastic part of settlers was indeed tinkering with a simple-yet-highly-complex economic system, and converting everything into military power to crush the enemy. Being forced to pause to let the economy do stuff and watching the little guys do their thing, and see visually what is efficient and what is a mess is great. And it is beautiful to see how attempts to micromanage / fiddle with the road structure sometimes works Really Well and sometimes creates a gigantic mess. The posts here make me very enthousiastic about CE, I am awaiting the release with excitement! This game has me terribly excited! If you guys can work out the mountain of technical challenges facing you you’ll get all the kudos there are to give! One quick question: I can only assume factories will allow for multiple inputs of different commodities to be assembled via workers or Perfectly Safe automated arms into one complicated commodity. The question is: how complicated to you expect the crafting to become? Will we be designing the placement of each individual commodity and manually constructing the new commodity piece by piece, or will we simply feed the input commodities into a box (for a lack of a better word) and watch as our new commodity exits the other side? Have you guys played SpaceChem? Go play SpaceChem. It is relevant. You build the factory itself, your people handle all the details of moving commodities around (if the process is not otherwise automated). We want to minimize micromanagement so it will certainly not be up to the player to hand-input anything at all. Hopefully Tropico was studied as well – best supply chain game with unintended consequences I’ve ever played. This also seems to resemble the factory system in rogue galaxy. When will there be a pre-order/ when can I throw money at this game? Everything looks great, I found out about this game from PC gamer magazine and it sounded awesome. Good luck! All these games you quote are what i used to play. All you promise is what i wanted. You already have my money ! Whoa. This is very intriguing. I’ll definitely be wanting a copy of this. You guys must have done a lot of research so far. This game sees very deep and strategic. Looking forward to the next great release here! Add in some puzzle goals like SpaceChem and I’m a customer. I’ve been thinking; would it ever be possible to do something like keep certain amoral or secretive procedures away from your citizens? For example if you had scienced up a way to render bothersome corpses into a nutritious paste, would you perhaps build a restricted factory behind high walls, operated and guarded by your most trusted and loyal subjects, fearing the point when these depredations would see the light of day for the wholescale revulsion and unrest it should beget the populace? I see, the Dwarf Fortress spirit has already arrived here. Sounds a lot like free enterprise.